ACLD offers a variety of residential opportunities for men and women who ready to take on a more independent role in a home of their own, with and without supervised support services. The supportive individualized residential alternative program provides independent apartment living for adults. There are 39 apartments throughout Nassau and Suffolk Counties. Individuals either share or live alone in an apartment in the community and are provided support staff based on their individual needs. Through this program residents gain the necessary skills to live, work and interact within their communities as independently as possible. The ultimate goal of this program, and for each individual, is to become completely independent of staff support. This program currently supports 67 people. The Community Habilitation Program provides habilitation services within an individual’s private home. The number of hours provided by staff vary based on an individual’s needs. One of the main goals of this program is to increase an individual’s independence while also providing support to both the individual and their family. This program encourages individuals to strive to live independently in the community with minimal staff support. The ISS Grant provides financial assistance to individuals who possess the skills necessary to live independently but require minimal financial support to live on their own. The amount of financial assistance an individual receives is based upon a review of their income and their expenditures. The Satellite Program provides community habilitation services on a fee-for-service basis to those individuals who do not have Medicaid. 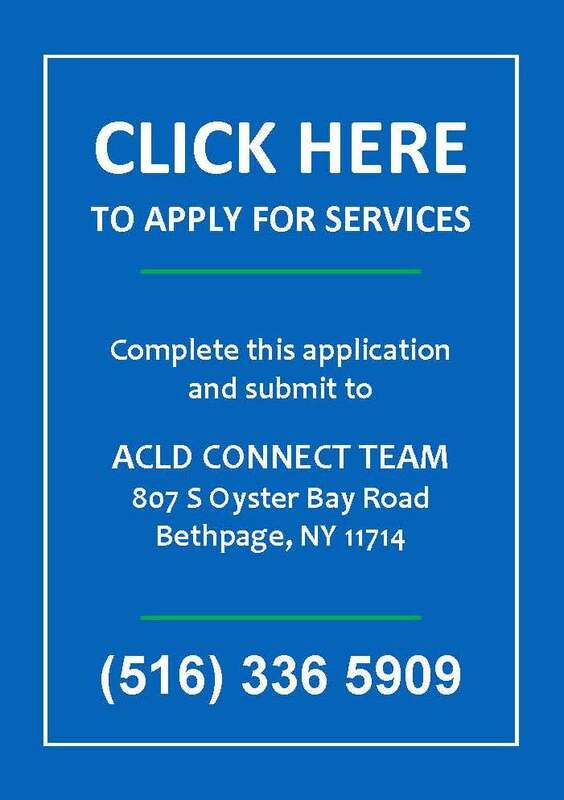 For more information regarding ACLD’s Residential Services, please contact ACLD’s Connect Team at (516) 336-5909 Extensions 171, 242, and 370.